For any of you readers in the neighborhood, I invite you to join me for an artist’s reception Friday night 6-9 at the Fort Worth Community Arts Center at 1300 Gendy Street. They are featuring their 9 x 12 Works on Paper Show. 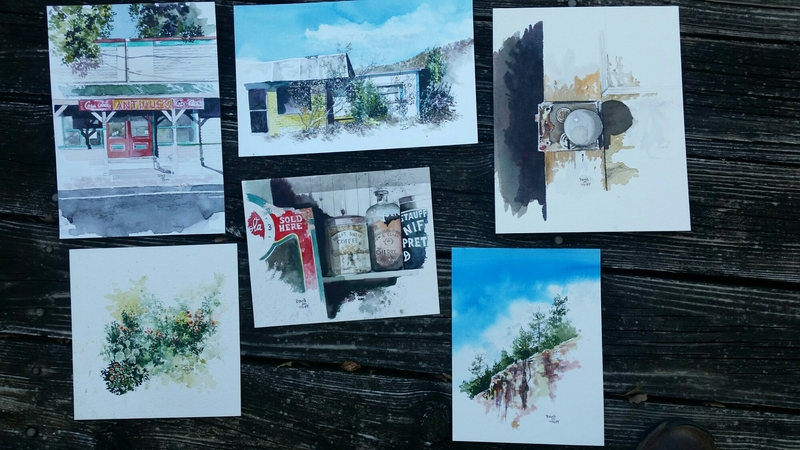 All art work in the show is 9 x 12″ or smaller and priced at $100. I will be there along with Elaine Cash Jary and a host of other artists. 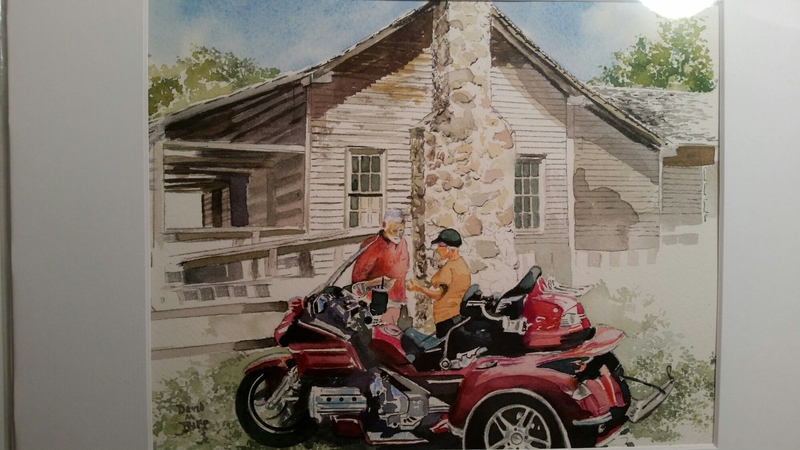 Elaine and I each have six pieces hanging in the show (mine are posted above), and Elaine has a large gorgeous watercolor that will debut in the Society of Watercolor Artists show at the same venue that night. The evening promises to be enjoyable and I hope you can join us. I paint in order to remember . I journal when I feel alone . I blog to remind myself that I am not alone . After letting this small watercolor sit idle for a couple of weeks, I decided this afternoon to haul it back out and see if I could beef it up by texturing the knob and locking plate. So far, the details I am adding with India ink, prismacolor pencils, graphite and X-acto knife. The texturing process has been fun and I’m happy with the way the painting is progressing. The window is rapidly closing on this wonderful Thanksgiving vacation. I’ve been grateful in spending quality time with family and friends, traveling quite extensively, reading quality literature and experimenting with drawing and watercoloring. I do love secondhand books that open to the page some previous owner read oftenest. The day Hazlitt came he opened to “I hate to read new books,” and I hollered “Comrade!” to whoever owned it before me. One of my deepest delights on this Thanksgiving vacation odyssey was perusing an antiquarian book store and finding these three volumes of Pope’s poetical works dating from 1853 and available for a price I could afford. With trembling hands, I opened the very fragile volume II last evening and read his Essay on Criticism. The opening lines I believed were worth repeating. Awakening this morning, the words from Helene Hanff rose to the surface of my consciousness, and I felt the urge to rise early, post this brief blog, then get to work on some art. Many times, essayists will stir me artistically because what they record of the act of writing I find apropros to the act of making visual art. Why not make a little collection of detached ideas which come to me from time to time completely molded and to which it would thus be difficult to attach others? Is it absolutely demanded that one produce a book, keeping within all the rules? Montaigne writes by fits and starts. Those are the most interesting works. This Thanksgiving holiday has been warm and cozy, and I’m always grateful to come back home and see family again. As the aromas of food cooking filled the house, I relaxed in a chair, reading from the writings of Delacroix, and came across this passage I’m posting. I was so inspired by it that I laid the book aside, pulled an old doorknob and locking system from my bag and began sketching it in my journal. My dad, liking what he saw, went out to his shed and returned with a second door knob. I removed mine and inserted his into the box and attempted a second sketch before dinner time. The time was rewarding, and I enjoyed the feeling of putting something like this on paper. Thanks for reading, and Happy Thanksgiving. I make art in order to learn. Get one form that looks like the tree, rather than little pickings at the branches. Give the tree its gesture. Some trees are heavy, ample and full. In a tree there is a spirit of life, a spirit of growth and a spirit of holding its head up. Now that the trees are casting their leaves up here in Missouri, I’m pulling out the pencils and sketchbook and trying to capture some of their movement, their essence. Since I was a child, I stared at bare trees more than leafed-out ones, and I’m really not sure why. I wasn’t drawing them as a child, and when I became an adult, I foolishly drew and painted trees for years out of my imagination rather than the way I do now–gazing at them, studying them, contemplating each one’s figure and portrait. Andrew Wyeth for years has fascinated me with his tree studies in pencil and dry brush. More recently, I have purchased a book on Leonardo da Vinci’s tree studies. I could spend he rest of my life learning this craft, I believe. 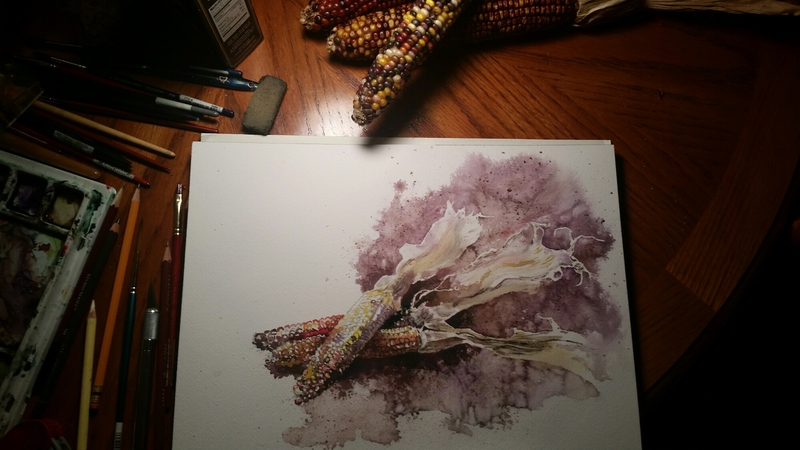 This is the first time I’ve had the urge to paint Indian corn. Finding some in my local grocery, I packed the bundle for my trip home to St. Louis. I managed to crank this one out on my first day here. And I found the subject a difficult one, just as I did the seashell studies a couple of years ago. I was caught off guard, thinking corn would be a simple study. I experimented with salt and bread crumbs on the background, and tried to render the fine lines in the shucks with pencils and X-acto knife. The kernels I found the most difficult, because of the highlights on nearly every one, and my pigments always dried duller than I wished. I’m thinking seriously of trying a second painting of this. I paint in order to learn. Jack Kerouac said, “Everybody goes home in October.” Well, it is November, but I am going home. The Thanksgiving holidays have arrived at a good time, and with coffee in hand, I am thoroughly enjoying this “windshield time.” The guitar music of Michael Hedges is soothing to me. 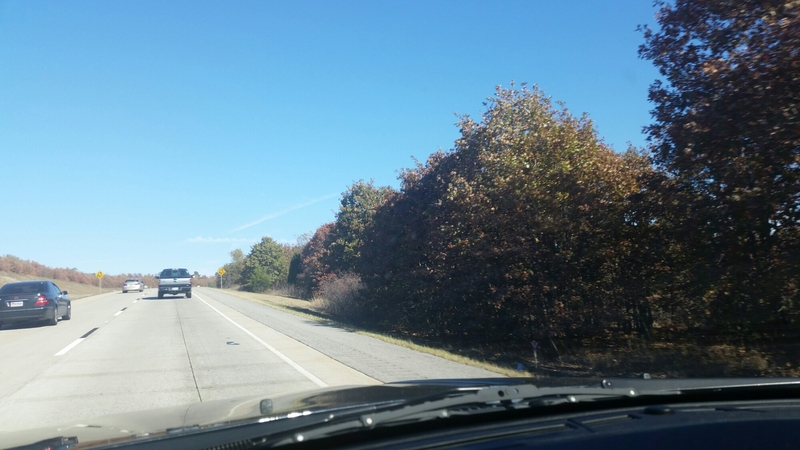 The fall colors are delicious in Oklahoma. And I am grateful for this long stretch of highway time that gives me the opportunity to let my thoughts glide by. At my age, the years accelerate. It seems that school started yesterday, but now I realize the semester ends in 3 weeks. And then another Christmas arrives. I love this time of the year, but there are so many sobering memories that cling to it and I find a commingling of joy and sadness. To say the very least, there is a real depth of feeling that attaches to this season of the year. My deadline for completing this was Thanksgiving. I’m glad I finished it Saturday night so I could get on with the Holidays. Nothing memorable was ever accomplished in a prosaic mood of mind. My coffe mug has “Daily Grind” wrapped around the outside. I pulled it from my cupboard this morning as my message for the day. As a school teacher for twenty-eight years, I know the daily grind–too many subjects to teach to too many students in too many class periods with too little time for absorption per day. In twenty-eight years that has not changed, and I’m confident will not change. I love the film Rounders and the role played by John Turturro whom they refer to as “The Grinder.” He makes a living playing cards, finding a way to pay the mortgage, alimony and child support (“My kids eat.”). He is portrayed as a rather joyless sage who knows what he has to do daily to pay his bills. But the paragraph just written is not what I consider the core of my life. For twenty-eight years, though grinding, I have blissfully educated myself, poring over the texts and materials necessary to put fresh bread before the students. And even if they did not absorb that daily nourishment, I did, incrementally, semester after semester, year after year. And I felt the growth of my own soul, appreciating every new shoot. My life has been enriched through the decades, doing what I’ve been hired to do. I echo the sentiments of Thoreau. I don’t sense within me a “prosaic mood of mind.” Throughout life, I have found a way to celebrate as I have fed on the religious sentiment, the literary and the artistic. It has all been good. And this day particularly has been good. Rising to my first cold morning of the season, I chose not to turn on central heating, but to go out back to my woodpile, fill the fireplace and begin a day-long fire. For four hours now, the crackling sound has soothed me as I’ve labored over a watercolor commission in my living room studio, enjoying the crisp winter light slanting across the drafting table and listening to Copland’s “Appalachian Spring.” This day has been filled with splendor because it marks the commencement of the Thanksgiving Holiday. Our schools are closed the entire week, so I will not be returning to the workplace on Monday. My holiday schedule is not exactly set in stone, but at least I know I have all the time necessary before me to complete this commission, then move on to the holidays. Thanks for reading. The morning has been truly delicious. Broadly stated, art is one’s effort to communicate to others one’s emotional reaction to life and the world. Once the clocks set back an hour and autumn (allegedly) arrives in Texas, I at least can appreciate the longer hours after darkness, if not the falling temperatures. Today we reached the low 80’s again, and I’m disgusted with the perpetual warm temperatures deep into November. Thanksgiving is next week and I recall days from my youth when temperatures had already reached the freezing mark. People today walked around in Tshirts and shorts. But once the sun goes down and the world darkens and the evening is still young, I find myself in a blissful state, entering the studio and watercoloring for hours. I have a commission deadline to meet, so I’m basically in the studio now when I’m not in the classroom. Tonight has been so delicious, as I’ve put DVD’s on the television and listened to various documentaries on the computer. The house has been quiet save for the voices of the movie On the Road (DVD), William Carlos Willams (PBS “Voices and Visions” (https://www.learner.org/catalog/extras/vvspot/Williams.html), and Edward Hopper and the Blank Canvas (https://www.youtube.com/watch?v=qk7nL27BxNg). These creative muses keep me company in the studio as music does to many other artists I know. The commission I’m doing is coming along slowly, but successfully. When doing such work, I probably would appear to an outside observer as A.D.D., but that is not the case at all. I am always looking at the work critically, pausing, stepping away from it, interrupting it with household chores and coming back to it. The old adage “cut once, measure twice” applies to my painting when I have to get it right. I don’t push the painting past my comfortable speed, but let it emerge slowly and thoughtfully. At the rate I’m going, I intend to have it finished by Saturday night, even if I have to stay with it after school tomorrow until late, and then rise on Satuday morning and linger over it throughout the day. I’m enjoying the process as I always do with watercolor. Once this job is complete, Thanksgiving begins for me, as the schools are closing for the entire week. I’m ready for a holiday. Thanks for reading. The night has been wonderful.